Heat oven to 375°F. Spray 9-inch round cake pan with Pillsbury Baking Spray with Flour. Let cookie dough stand at room temperature 10 minutes to soften. In medium bowl, break up cookie dough. Beat in club soda, egg and cardamom with electric mixer on medium speed 1 minute or until smooth. Spread batter in pan. Place apple slices in spoke fashion around edge with 2 slices in the center. Press apple slices into batter and spread batter to cover completely. Bake 35 to 45 minutes or until golden brown and center springs back when touched lightly. Cool 10 minutes. Remove cake from pan. In small microwavable bowl, microwave frosting on High 10 to 12 seconds or until very soft; stir. 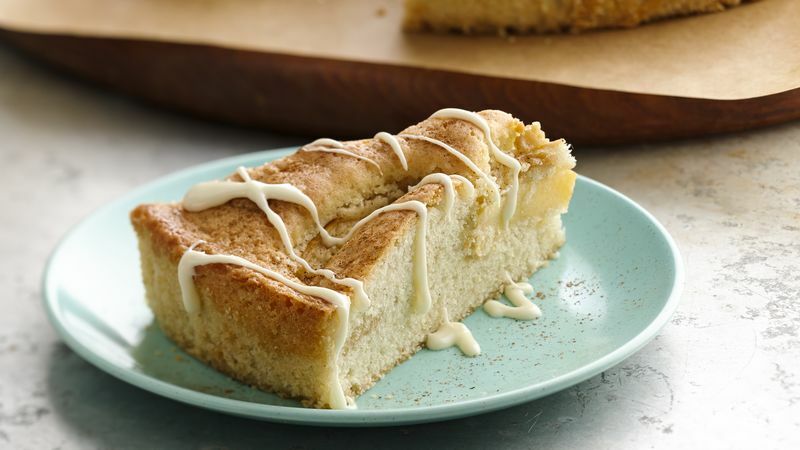 Sprinkle individual servings of cake with cinnamon; drizzle with frosting. Serve warm.